MANILA, Philippines — Pintô International presents “Living Earth: Contemporary Philippine Art,” which opens on May 6, from 6 to 9 p.m., at MAC (MusicaArteCultura), Piazza Tito Lucrezio Caro, Milano, Italy. “Living Earth” features the works of over 25 contemporary Philippine artists. The exhibition seeks to bridge the distinct yet interconnected national histories of the Philippines and Italy, creating a dialogue of artistic exchange around humanistic themes: homeland, migration, identity. The exhibition will be on view until May 12 at Milan’s cultural organization MAC. The exhibition is co-curated by Luca Beatrice, curator of the 2009 Italian Pavilion of the Biennale di Venezia, and Patrick D. Flores, artistic director for the forthcoming 2019 Singapore Biennale and formerly the curator of the 2015 Philippine Pavilion of the Biennale di Venezia. 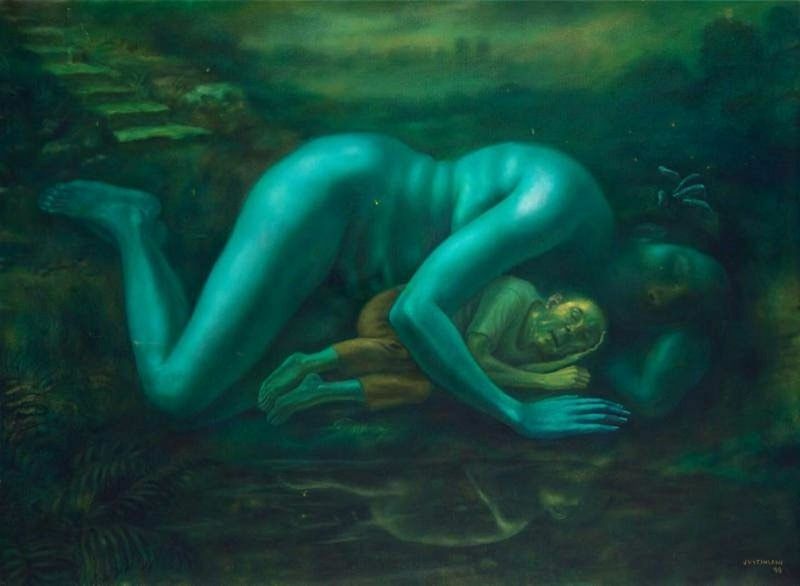 Among the exhibition’s many highlights is the iconic painting “Mother” (1999) by Mark Justiniani, who is currently representing the Philippines at the Venice Biennale. Hazy, yet phosphorescent, Justiniani’s painting, which belongs to the Pinto Art Museum’s permanent collection, imagines a dream-like space not unlike Pacunayen’s signature art. 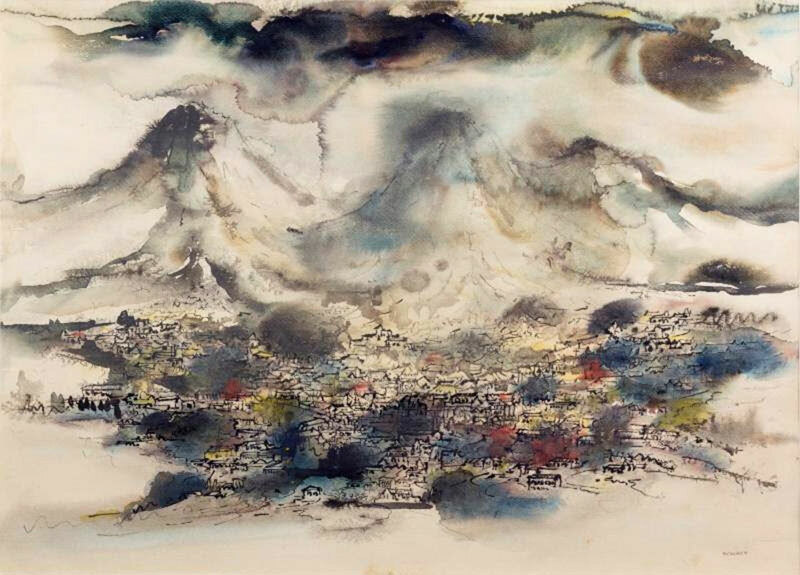 This example of Justiniani’s early work is echoed by the paintings of Elmer Borlongan and Emmanuel Garibay, artists whom he spent formative years with and initiated the movement of social-realism in the late 1980s Philippines, after the fall of the Marcos regime. Their work is juxtaposed against paintings by artist Manuel Ocampo, the Philippine representative at the 2017 Venice Biennale and one of the most critically acclaimed Filipino artists internationally, and Rodal Tapaya, whose works emphasize a sense of transformation and transportation through his implementation of magical realism. Moody, somber, and infused with a sense of the uncanny, Johanna Helmuth’s figurative scenes are arresting depictions of contemporary life in the Philippines. Helmuth, who won the 2018 Ateneo Art Award, given to an artist under 36 years old for outstanding work, is also joined by emerging talents like Jayson Oliveria, who pioneers a gestural approach to painting that purposefully eschews perfection. These artists, along with the others included in the exhibition, create a cross-generational dialogue, presenting a more nuanced picture of contemporary Philippine art. Patrick D. Flores is professor at the Department of Art Studies at the University of the Philippines, which he chaired from 1997 to 2003, and curator of the Vargas Museum in Manila. He is adjunct curator at the National Art Gallery, Singapore. He was appointed artistic director for the 2019 Singapore Biennale, curated the Philippines Pavilion at the 2015 Venice Biennale, and in 2018 was listed among the 100 most influential personalities in contemporary art in the world by ArtReview. Pintô International was founded in 2017 in New York City with a mission to promote the work of contemporary Philippine artists on an international stage. Founded to support the mission of its parent institution — museum and non-profit foundation Pintô Art Museum in the Philippines — Pintô International is the New York-based entity that drives Pintô’s global exhibitions and programming. The organization presents quarterly exhibitions, an artist residency program, and a monthly Pintô Sessions event series at its East Village location. Pintô also produces a series of international satellite exhibitions coinciding with international art fairs, biennials, and other global arts initiatives that further foster its mission of cultural diplomacy. The organization provides critical support to artists from the region with the intention of encouraging their wider professional development, and, in turn, greater appreciation for their work by international curators, writers, collectors, and other contemporary art communities. The participating artists are: Renz Baluyot, A. Barrioquinto, Elmer Borlongan, Zean Cabangis?, Keb Cerda, Jigger Cruz, Marina Cruz, Ronson Culibrina, Igan D’Bayan, Dale Erispe, M. Andy Garcia, Emmanuel Garibay,Johanna Helmuth, Winner Jumalon, Mark Justiniani, John Marin, Raffy Napay, Gabi Nazareno, Manuel Ocampo, Jayson Oliveria, Jim Orencio, Lee Paje, Dexter Sy, Rodel Tapaya?and Olan Ventura. For information on Pintô International, visit pintoart.org and follow on Instagram via @pinto.art.